July 4th is right around the corner, which means celebrating America’s independence and grilling out. For most, hot dogs will be the meal of choice. It is estimated 155 million hot dogs will be eaten this weekend alone. However, if you are getting tired of the traditional wiener-bun-condiment combo, but still love the taste, you are in luck. May we present to you: Hot dog ice cream. It’s crazy. It’s delicious. And it’s going down this weekend. 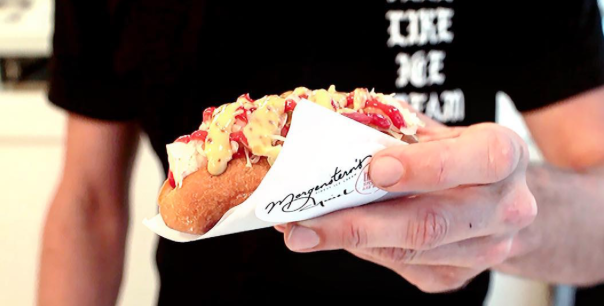 Meet the “DBGB cool dog” – @danielboulud’s frozen salute to the 4th of July. // Hot dog ice cream on a toasted brioche bun with candied cabbage, berry ketchup + spicy honey mustard. // Only at @morgensternsnyc + DBGB. This culinary creation comes from the chef Daniel Boulud and the folks over at DGBG, a New York City restaurant, in collaboration with Nicholas Morgenstern and Morgenstern’s Finest Ice Cream. The ice cream is exactly what it claims to be, hot dog flavored, and it is served with all the normal fixings you might find on a traditional hot dog. I suppose if you love sweet and salty treats, this would be right up your alley. Still, I think most of us will be content with a regular hot dog this holiday weekend. But if you are feeling adventurous and in the New York area, you can grab one of these dogs at both the DBGB Kitchen and Bar and Morgenstern’s Finest Ice Cream.